Attila Kapitany’s garden will greet visitors with a kaleidoscope of colour when it opens on the 27th and 28th August for Open Gardens Victoria’s official 2016/17 Season Launch. 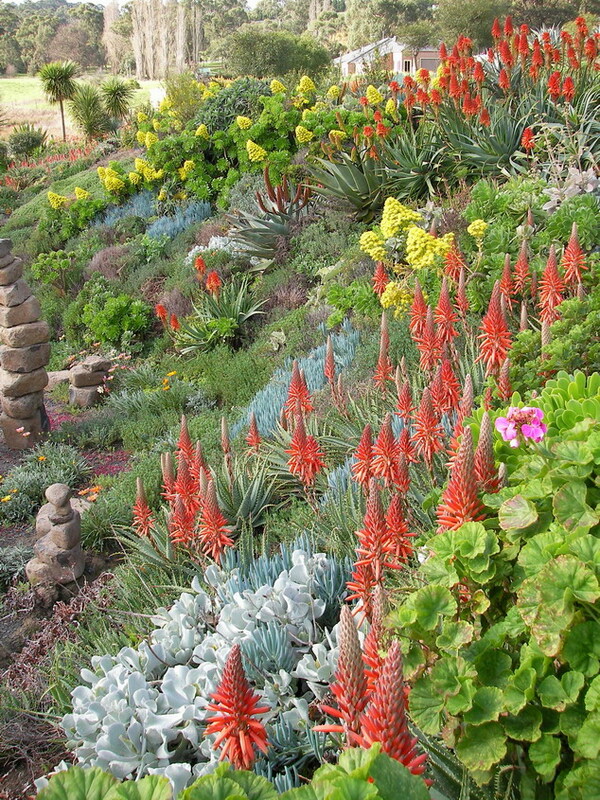 A recent sneak preview of the drought tolerant, succulent-filled garden shows some spectacular flowering plants reaching their peak in time for the launch, including vibrant aloes, ground covering pig-face species and stunning aeoniums. What better way to usher out winter and welcome in spring? OGV is delighted to announce that garden media personality, author and rare-plants nurseryman, Stephen Ryan will be officially opening OGV’s new season on Saturday 27th at 2pm. The launch also marks OGV’s first birthday as an organisation and there will be cake and door-prizes to celebrate. Attila Kapitany will be conducting tours of his garden every two hours across the weekend and there will also be books, seeds and plants for sale. There will be several new hybrid succulents available, which have been bred on-site by Attila and Michele. One such species on offer is the gloriously golden variety of pig face – x Disphyllum ‘Sunburn’. The Kapitanys have crossed a South African and Australian succulent to produce this groundcover, which will grow in just about any situation and flowers for most of the year with gold to yellow flowers.